Of the seven figures in Marvel Legends Series 6, only four were new creations: the rest were orphans from previous series, finally given a warm and welcoming home. Hawkeye, here, has had the shortest wait of them all. He was supposed to be a variant in Series 5 (for Hawkguy, naturally), and now here he is in Series 6! Granted, if you count the Wolverine, Captain America, Amazing Spider-Man, Guardians of the Galaxy and X-Men Legends series, which have all come out since ML5, it suddenly looks a lot longer. 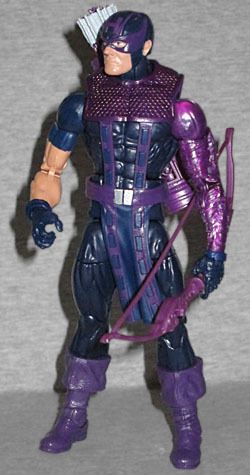 This figure has the same base body as the other Hawkeye, but that one was in his "Marvel NOW!" costume, while this one is in his "Heroic Age" costume. Say what you will about Marvel and their constant rebrandings, but as long as characters only ever change their costumes when the big events happen, it certainly makes them easier to identify by name. To create the costume he gets a new belt/harness/chainmail-dickie combo piece, Bucky Cap boots, and - in a truly clever move - Winter Soldier's mechanical arm stands in for Clint's chainmail sleeve. Brilliant re-use, guys! Clearly the head is new, because clearly there was no way Sam Greenwell's ML7 Hawkeye head would work here. He still has the Wolverine-style mask flaps, but they wrap around the sides of his head instead of sticking out. The H on his forehead is separate from the two thick seams that run over the top, and there are some really subtle wrinkles sculpted above his ears. 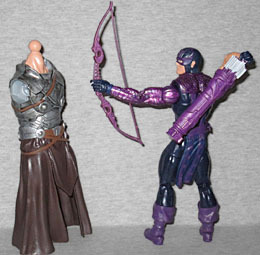 His accessories include the same bow and quiver of arrows as the previous figure, which makes sense (since they were supposed to be variants of one another), but this time they're molded in purple, rather than black. His Build-A-Figure piece is the entire torso of The Allfather (not specifically Odin, as we'll discuss when we get to the BAF review), including the heavy skirt that will wrap around his legs. It's a bit surprising that wasn't broken up more. At least with a separate skirt or something.